Save $300 to $2,000 per couple off this cruise. Expires April 30. Click here for eligible departures. Spend a day at leisure to sample Brussels hearty cuisine and famous beer. DISCOVERY Visit the In Flanders’ Field Museum in Ypres— learn about the story of the invasion of Belgium, the first months of the mobilization, the four years trench war in the Westhoek, the end of the war, and the permanent remembrance ever since. After your visit, enjoy lunch at the museum’s café. CLASSIC Join a Guided Walking Tour of the historic merchant city of Middelburg—with its 15th century gothic Town Hall. You’ll learn about the spice trade of this Dutch harbor capital of Zeeland, its prosperity in the Dutch East India Company trading, and origins as a stronghold city. Enjoy its winding cobbled streets and canals that circle Old Town. ACTIVE See the sights of Amsterdam from a unique perspective by joining our Guided Jogging Tour of the city—all at an easy pace with stops for commentary. You may choose an Optional City Biking Tour to discover the countryside. Join us for a special tulip season departure to experience moving WWI history in Holland and Belgium. A history expert accompanies our cruise with visits to the underground city of Maastricht and the Ardennes Battlefields, as well as the memorial sites in Bastogne. Visit the legendary battlefields of Eastern Flanders, including a Last Post ceremony at Menin Gate on Anzac Day. Begin your vacation in Holland your way before your cruise with an overnight stay in Amsterdam and enjoy a guided canal cruise. Enjoy superior hotel accommodations with complimentary breakfast, guided sightseeing with an expert Local Guide, and courtesy hotel-to-ship transfer. 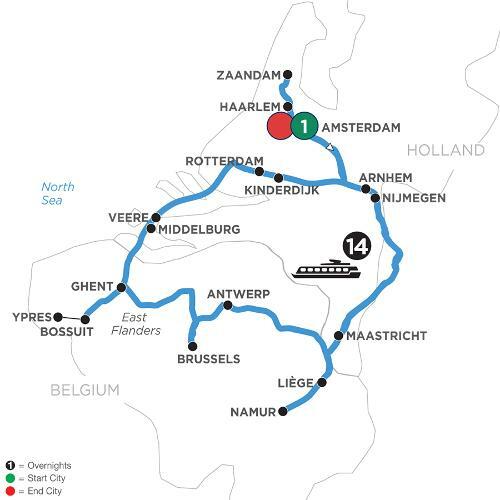 On to Belgium for a tour of Namur. In Liège, see the ancient quarters of the “Fiery City,” and explore the city of Antwerp. See the cathedral’s stunning altarpiece paintings by the Flemish master Peter Paul Rubens. Explore Brussels with a tour of its landmarks, and visit Ghent, for stunning Flemish artwork in St. Bavo’s Cathedral. Visit Bossuit’s In Flanders Fields Museum, and Middelburg’s historical trading port. See the remarkable Veere Delta Works. Continue through Kinderdijk—where windmills became a symbol of Holland. Visit Rotterdam, Zaandam, and Haarlem—quintessential Dutch towns. In Middelburg, explore its grand history in the Dutch East India Company, and see the remarkable Veere Delta Works. Continue through Kinderdijk—where windmills became the symbol of Holland. Visit Rotterdam, Zaandam, and Haarlem. You’ll return to Amsterdam for a guided canal cruise through the iconic city.